Located in the Ballard neighborhood of Seattle, the HQ is being built from four containers that have been stacked, and are being built between, occupying a footprint of about 50×30′. It occupies a quarter of the total space, which is a shared studio space for Funkworks Inc, a collective of roughly 10 artists that include metal working, wood working, fine illustration, printmaking and mural art, as well as being home and meeting space for the Seattle Cascadia Arts Collective. 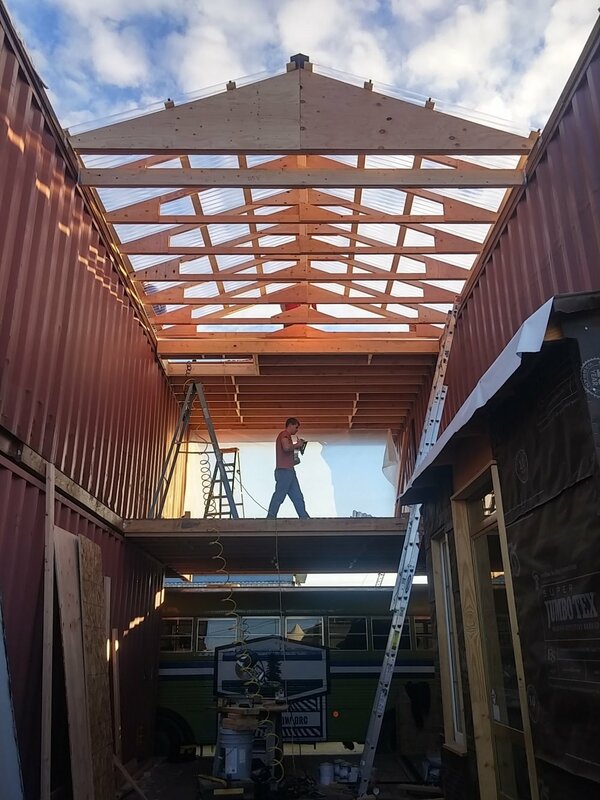 While the space is for public use, it is being built through donations by executive director Brandon Letsinger, with Funkworks & Seattle CascadiaNow! members. With the space being secured in May of 2016, construction began in earnest over the winter, and will likely be complete in the upcoming year. We also have outdoor barbeques on most Tuesdays! If you would like to be a part of the build team, or help us envision green and urban sustainability designs, please email cascadianow@gmail.com.